It had been a few years since I had ventured in a Eureka Restaurant Group establishment. A previous experience at a Eureka! Burger in Redlands, CA left much to be desired. Still, when Happy Meal and I were invited to the soft opening of the Eureka! 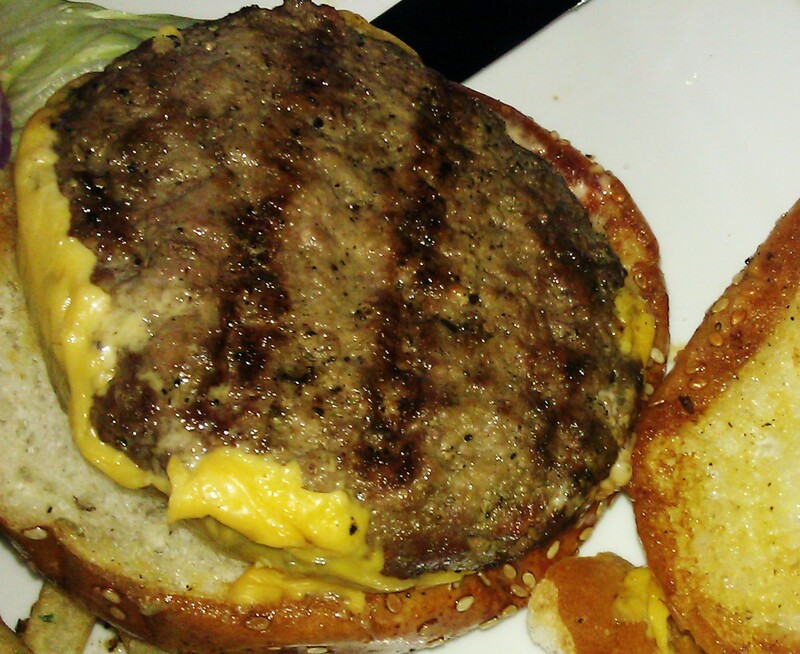 Tasting Kitchen in Hawthorne, CA, we had to give them a second chance to serve up a great cheeseburger. The restaurant was located at the Hawthorne Airport, so Happy Meal and I enjoyed watching helicopters take off and land as we waited for our meal. While we were there, we learned that the Redlands, CA location was the first, and that the enterprise had grown to 9 locations since 2009. Eureka! Burger was family owned and operated with sons, daughters, and spouses all taking key roles throughout the organization. Eureka! Tasting Kitchen featured a tasting kitchen in an upstairs space, while the downstairs area housed the 88-seat restaurant. This was the first new full-service restaurant to open in Hawthorne in the past 15 years. Triumph the benefits of handmade food, locally sourced produce and fresh baked breads found throughout our chef driven menu. You'll find an authentic, one-of-a-kind experience serving a wide selection of hand packed, 100% vegetarian fed, hormone & antibiotic free, all natural beef burgers, our signature handcut fries, gourmet salads, signature sandwiches and delicious desserts. We strive to treat each guest as an important individual and prepare each plate with the pursuit of perfection in mind..."
We ordered a couple of the Original Eureka! Burgers with cheese--$9.50 (and $1.00 extra for cheese). The Beef: The burger meat at Eureka! Tasting Kitchen was 100% Certified Angus Beef. The beef was fresh, and it had been delivered pre-ground by the supplier. The cut was Chuck, and the fat content was at about 20%. The flavor was strongly beefy with a hint of funk from aging. The flavor was not complex, but it was satisfying, and Happy Meal gave it an enthusiastic thumbs up. The burger meat was juicy, and the bite was loose to the point of being crumbly. The beef in The Original Eureka! Burger was above average. The Seasoning: The exterior of the burger patty was liberally seasoned with salt. The seasoning nicely enhanced the beefiness of the 7-ounce cheeseburger. 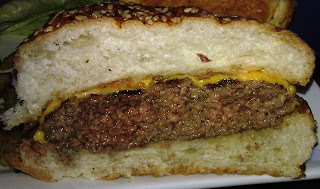 The Sear: The sear on the bottom of the burger patty was unremarkable. The sear on the side of the patty that was covered in cheese was better. The burgers would have benefited from a strong, dark sear, but this was a soft opening, and the kitchen was slammed. The Preparation: The ground beef was formed into loose patties during the prep cycle. I requested that my cheeseburger arrive cooked to Medium, and that was what I received. The burgers were cooked on a gas-fired grill. The burgers were turned once as they cooked, and that was appropriate. Too much fussing with a burger as it cooks leads to a dry burger. The Cheese: There were 5 cheese choices, and I went with the American. The cheese was nicely melted, and it contributed just enough iron and creaminess to round out the flavor and texture of the burger meat. The Bun: The locally-sourced bun was big, soft, seeded, and relatively neutral. The burger bun was moist, fresh, as buttery as a croissant, and mildly savory. The bun compressed perfectly, and it contained all of the juices from the cheeseburger. The Meat To Bun Ratio: The was perfect. The Toppings: The Iceberg lettuce was just fine, and the tomato slice was flavorful and ripe. The Fries: The peel-on fries were sourced from Kennebec potatoes. The fries were hand-cut (in-house), par-cooked, and finished with salt and parsley. The seasoning was spot on. The fries were dark and crisp. They were creamy on the inside, and they delivered a strong, earthy, potato flavor. 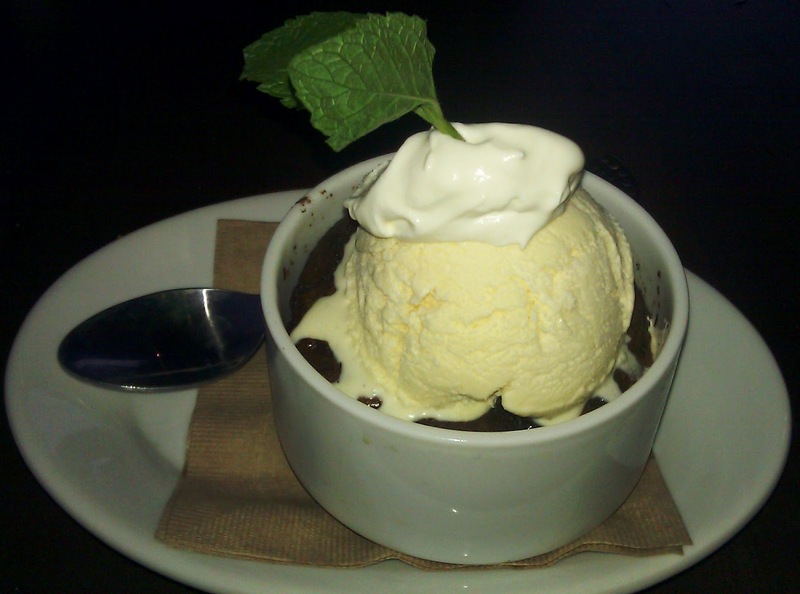 Dessert: Get the Chocolate Espresso Souffle Coffee Cup Cake! This was a treat. Trust me on this. Eureka! Tasting Kitchen was ambitious in terms of location. They certainly delivered when it came to the cuisine;. The cheeseburgers were well above average. Burger Review : Darn fine cheeseburger at Eureka! Tasting Kitchen. Quality ingredients were prepared with great skill.